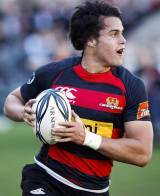 Sean Maitland was one of the most exciting young backs in Super Rugby but gave up on his All Blacks ambitions when he switched to the Glasgow Warriors during the 2012-13 season. The Tokoroa-raised winger first came to prominence in 2007 when he played an integral role in the New Zealand Under-19s' World Cup success. He was also a part of the Baby Blacks side which lifted the inaugural IRB Junior World Championship the following year. He took to Super Rugby like a duck to water, featuring in every game as the Crusaders powered their way to the title in 2008. Maitland then helped Canterbury claim the Air New Zealand Cup in 2009 but his Super Rugby season had been ruined by hamstring problems which restricted him to just one game. However, he was injury free in 2010 and after a Super Rugby campaign in which he showed his versatility for the Crusaders in regularly lining out at fullback, he then starred for the New Zealand Maori in their centenary games, sparking the winning try against Ireland in Rotorua with a superb break. Maitland continued to excel and he enjoyed his most impressive season to date in 2011, turning in a string of scintillating performances as the Crusaders progressed to another Super Rugby final, with the highlight of his season a record-equalling four-try haul against the Brumbies in March. He failed to make a dent on the international scene and was still waiting for his first All Blacks cap when he agreed a move to Glasgow. And instead of pulling on the black of New Zealand, he wore the blue of Scotland after being named in the XV for their match with England. A strong tournament, which included a try on debut against England, raised the possibility of him returning to the southern hemisphere as a Lion. And the call came from Warren Gatland as he was named as one of four wingers in the squad to travel to New Zealand. Maitland featured in five of the seven non-Test matches, scoring a try in his final appearance on tour against the Melbourne Rebels. But he failed to make it into the match-day sqaud for the Test series as the Lions secured a 2-1 victory over the Wallabies.